I came across the following heartwarming lines of poetry by Shaykh Abd al-Rahman bin Abi Bakr al-Mulla, one of the senior ulema of al-Ahsa who passed away aged 98 in 2001. A brief biography can be found of him on this blog, however I will suffice by mentioning that he studied in his native al-Ahsa with the its numerous scholars, and travelled to the Hijaz where he studied in the Sawlatiyyah school as well as travelling to Taif and Madinah al-Munawwarah to benefit from the ulema there. Someone mentioned to me recently that they heard regarding Shaykh Abd al-Rahman that when in the Hijaz during times of monetary difficulty and lack of food he would suffice himself on bread dipped in zamzam water. 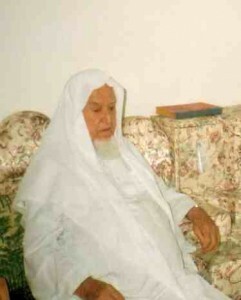 When I spoke to his grandson about him and asked him which ulema did his father mention the most, he replied that he would often speak about Shaykh Alawi al-Maliki (father of Shaykh Muhammad) and Shaykh Muhammad Nur Saif amongst others, both of them were his colleagues in the study circles which took place in Makka. Towards the end of his life his home in al-Ahsa became the visiting point of numerous students of knowledge who eagerly sought his ijazah, as he was one of the last remaining students who had studied extensively in the Haramain with its muhaddith, the great Shaykh Umar bin Hamdan al-Mahrasi. The following lines of poetry were written by Shaykh Abd al-Rahman as supporting words to the work of Kuwait’s Shaykh Yusuf al-Rifai in defence of Shaykh Muhammad bin Alawi al-Maliki. The lines of poetry are clear proof regarding his viewpoints on certain issues and are a clear testimony to the manhaj of the traditional ulema of Saudi Arabia.